The etymology of Komper's Orchid is interesting. 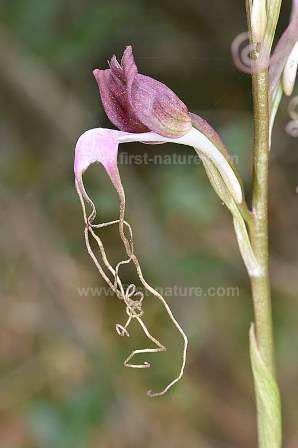 After time spent in the Orchis genus (Orchis comperiana), and as a monotypic genus - Comperia comperiana - it has now settled with the Lizard Orchid (Himantoglossum hircinum) and the Giant Orchid (Himantoglossum robertianum) in the Himantoglossum genus. With its distinctly hooded flowers Komper's Orchid has much in common with the Lizard Orchid and the Giant Orchid, but even at its most robust it doesn't grow as tall, reaching around 65cm at best compared to the 110cm which is achieved by some specimens of the other two species. In Turkey not only is Komper's Orchid rare but it is also under serious threat from, of all things, the confectionary industry which uses the starchy tubers of orchids to thicken and add taste to dairy desserts and drinks. The tubers are collected, dried and then made into a powder called salep before being sold on to the food industry. As it requires in the region of 1,000 to 4,000 orchid tubers to produce 1kg of salep, it is not hard to understand the devastating impact that this practise has on wild orchid populations in the region. There are, of course, many substitutes that could be used instead, but the production of salep is a very lucrative business for all those concerned and that adds considerably to the problems for those who would seek to protect the orchid species involved. The distribution of Komper's Orchid covers the Crimea (the most southerly part of Ukraine), the islands of Lesbos and Samos, Turkey, Lebanon and Iran, but nowhere is it common. Himantoglossum comperianum grows on predominantly calcareous soils in open conifer forests, and very occasionally in grassland. Depending on the altitude this orchid blooms from April to August. The specimen on this page was photographed in Lesbos. Picture by kind permission of Paul Sterry Nature Photographers Ltd.